Interested in other industries? Explore our cover letter example database. 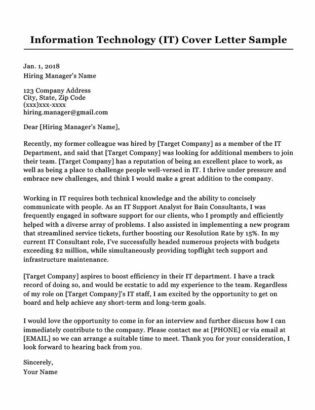 I am writing to express my great interest in filling the Senior IT Project Manager position at AeonIT, as advertised on LinkedIn. 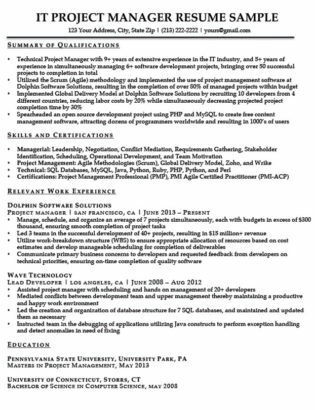 I am a PMP certified technical project manager with over 5 years of experience managing IT projects, as well as 4 years as a lead web developer. I am confident that my unique combination of experiences make me the ideal candidate for the job. Over the past 5 years at Dolphin Software Solutions, I have used my advanced expertise with Agile methodologies and project management software to ensure the efficient and cost-effective completion of over 40 projects. In addition, my intimate familiarity with web development enables me to effectively communicate with and understand the needs of developers. I heard on the news that AeonIT is increasing its efforts to expand globally. This is an area where I excel, having implemented Global Delivery Model which decreased costs by 20% and project completion time by 30% at my current company. I would be more than thrilled for the opportunity to provide similar results at AeonIT. I would love to come in for an interview to further discuss how my unique experiences and long track record of successful project management can benefit AeonIT. You can reach me at [PHONE NUMBER] or by email at [EMAIL]. I can be available to meet at any time, provided I am given one week’s notice. Thank you for taking the time to look over my application, and I hope to hear from you soon. If the job description specifically mentions any particular skills that you possess, make sure to emphasize them in your cover letter. In addition, demonstrate how you can use those skills to benefit your target company. Notice how the candidate not only mentions that they have a required skill for the job, but also demonstrates how they used that ability to yield results. Project managers work in a wide-variety of professional fields, such as IT, construction, and energy etc. Showcasing you have experience or knowledge in the specific field of your target company can sometimes sway the hiring manager even more effectively than your project management abilities. Emphasize how your combination of experiences makes you an asset to the company. For example, our sample candidate mentions that they have experience both as a PM and as a web developer — they then further emphasize how that combination of experiences will make them an asset to the company. On the other hand, if you lack experience in your target company’s field, place more emphasis on your excellence in project management. Do this by demonstrating your knowledge of management methodologies, software, and your success completing projects. A cover letter gives you the ability to properly describe your soft skills. While on a resume you may only have space to write “communication skills,” in your cover letter you can give details to prove those skills and show how you have used them to achieve great things. Here the candidate elaborates on the nature of their communication skills. Specifically, they mention their ability to communicate with the developers in their team. Many projects fail due to poor communication between departments. As such, any project manager who can prove they have effective communication skills is going to have an instant advantage over other candidates. Make it so in your cover letter. Don’t make your cover letter all about you. While it’s important to express your enthusiasm and strong desire to work at your target company, you also need to demonstrate what you will bring to the table. Research the company beforehand and familiarize yourself with their products and practices. Try to find out what projects they’ve been working on recently, and tell them how you’d like to help them further those projects and achieve future goals. Highlighted in yellow is the company’s current undertaking, and the green is the candidate showcasing they have the knowledge and skills necessary to help complete this endeavor. Try to find something your target company is doing where your skillset makes you an asset, and then tell them exactly what you could do to help achieve their goals if you were an employee! In project management, results are everything. And the most effective way to display those results is with numbers. Quantifying the results of your actions at previous companies will clearly and effectively communicate your abilities to the hiring manager. As such, every time you have the opportunity to include numbers — do it. The candidate clearly presents how much experience they have, the number of projects they’ve completed, and the concrete results of their actions — all through quantification. Had they simply written, “decreased costs and project completion time,” or “completion of many projects,” their cover letter would be far less compelling. Adding specific numbers to your cover letter makes your accomplishments seem more impressive, and effectively communicates the extent of your abilities to the hiring manager. Both of which will compel the hiring manager to turn the page and check out your resume. Having a great cover letter is only one half of the equation. Having a great resume will give you the full package. Remember that your project management cover letter is the first thing the hiring manager will see. Following these tips will ensure that your first impression is a good one. However, if you’re still feeling unsure about yourself, take a look at our library of cover letter examples to find inspiration. If that seems like too much work, our professional cover letter builder can get it all done for you in minutes!